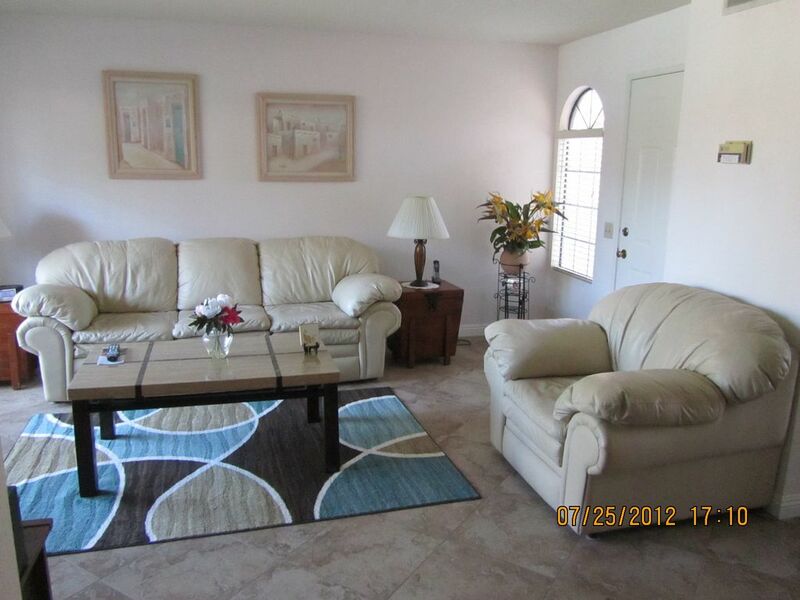 Very comfortable, quiet, spacious, light, Non-Smoking Condominium in the beautiful Mesquite Country Club - A gated community with an 18 hole golf course next door. This condo is in Phase 1 and faces E Ramon. This is an End Unit on the Ground floor with a view of the pool & Spa from the living room. Sit outside and relax on one of the two patios. The 2nd patio is outside the bedroom and houses a laundry with full size washer & drier. There is a Queen-size bed , 2 night stands and a dressor and a full length mirrored closet in the bedroom with plenty of room for storage.There is also a queen-size leather sofa sleeper with foam mattress in the living room and feather mattress that can be added for comfort. There is also a double bed electric air mattress in the bedroom closet. There is a 32 inch HDTV in the bedroom. The remodelled kitchen is fully stocked with everything you need for your stay with modern appliances. The dining room has a table and seats 4. There is a 46 inch HDTV in the living room with DVD and stereo system and a TV in the bedroom. Just two miles from the Main Strip. Very Close to the Airport and Shopping. Per the Palm Springs Vacation Rental Ordinence 1918, Please be aware. AGE: you must be 25 yrs old to book this property. Occupancy: the maximum number of overnight guests is 2 adults plus 2 children under the age of 12. NOISE: Be mindful of the neighbors & limit noise to respectful levels. Outdoor music is not permitted at any level, anywhere. NO PARTIES OR EVENTS. VIolation of the city ordinance are fines of $5000 & HOA penalty of $1000 and may result in immediate eviction without a refund. I Live in New Zealand and love to come to Palm Springs with my friends for a get away. I am pleased to share my condo with others so they to can enjoy this beautiful Place. Palm Springs is in a beautiful setting. The high mountains. The history of the town. The local activities. The spa,s. The weather . I love to walk around the golf coarse. I like to experience the Thursday night street fair in downtown Palm Springs. The outlet mall of Cabazon. The dining experiences. The crab Pot is excellent. There's a Lobster buffet, all you can eat at the Augustine casino on a Saturday night. The local spas, Friday is ladies day at desert Hot springs, a treat I always enjoy. May park anywhere but vehicle must display a parking sticker. Only one covered space per condo. Spectrum cable provided by HOA.